Sorry for the super-late reply. I ended up doing the pruning before receiving any of the responses (because I was going away for a month and didn't want to wait that long). I miraculously managed to do exactly what all you smart people recommended - I left the bottom to its devices and chopped that crooked top to the next bud. Honestly, I should have done that when I got that tree, but hey, better late than never. Thanks so much for piping in and providing advice - even if it wasn't available to me before my decision, I feel validated and will know to give that tree some more time before any other chopping (if any). 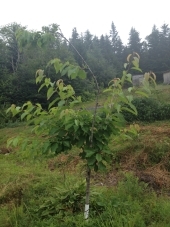 I have a sweet cherry tree that has some shape issues This year is the first year of truly good growth on it since we planted it, and so I would like to work on reshaping it into some proper form. The main trunk doesn't have anything going on - just that tuft of leaves up top and one branch halfway up. There are multiple fresh-growth branches from around the middle of the tree. I'm not shy with pruning, but this one really has me stumped - any advice on what could be done here? 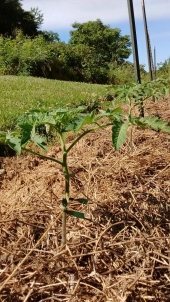 Edible plant exchange in Canada? Cristo Balete wrote: S Usvy, urine and paper is considered black water, so that isn't supposed to exit the house unless it's into a septic tank. So that's why urine going down that greywater line is not good, unless you set up a reedbed system that is contained and not allowing the liquid to touch the soil until it's been in the bed however long it's supposed to be there. Canada has some municipal reed bed systems, so they've decided they are okay for municipal waste. I'm not sure of all the requirements, but it is being done legally in some places. I can see why you wouldn't want to tear up your cement to change that. If you sell your house, or your house out-lives you, which it will, it will have to be disclosed that it's hooked up wrong, and that is a serious code violation. If you don't get those people back to fix the code violation they created, it becomes your responsibility. New owners have to right to expect to be able to flush the toilet and not have it go out onto the ground. If it's going to change hands,t you could just plug the whole thing up as it exits the house, and don't sell it with the greywater line feature. 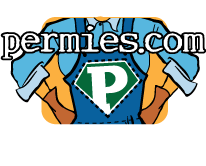 The urine regulation (if it's correct), feels silly - a lot of people use urine as a fertilizer; there are no bacterial issues of any kind there. I can see why the regs would be that way when it comes to toilets, maybe (to be on the safe side, what if someone does a number 2 in your toilet), but on the whole, putting urine together with blackwater is not right (in the grand scheme of things being universally right and wrong; usually has nothing to do with regulations ). As for the disclosure or seal-off - yes, I agree. I wouldn't sell a house to anyone if they could flood their front lawn with poo water. Peter Ellis wrote: I am curious about something - does Oasis recommend 1.5 inch as a minimum? Or does the author recommend 1.5 inch as the size to use? I am having some difficulty seeing where there would be a problem staying with the 3 inch pipe and can't imagine why he would recommend against it. Sorry for falling off the face of the Earth - went on a road trip in some more remote bits of Canada for a couple of weeks, and have been trying to catch up with life since coming back. In the book, 1.5'' to 2'' pipes are depicted as having solids float or roll along in the pipe with the water flow. In tighter pipes, there's not enough air flow. In larger pipes, the fluid is not deep enough to make the solids float along. According to the book, at 3'', solids "roll along somewhat", and at 4'' solids are "an immobile island in thin flow". The 1.5'' recommendation is based on the flotation of solids in the greywater stream and based on cost. So I'd think that we would either do a vertical reduction to 2'' or go with 3'' all the way (which would be more expensive). 1) I will NEVER put blackwater down the greywater line. The feces are dealt with separately in a humanure setting. 2) I was asking about having the grade of the greywater higher than recommended, not lower than recommended. I am aware of avoiding flat areas or saggy areas. When we built our house, we had a greywater line put in - there's a simple valve that determines whether the outflow goes to the septic or the greywater (of the entire house, yep, toilet too; got to love rural building inspectors, lol). The greywater line ends with a stub-out at the house wall, but it's time to plan for its actual use. We have a humanure toilet, which deals with feces, so that's good. I'm planning to only use the greywater line outside of frosty months, because Zone 5 and screw all of that extra complicated stuff to keep it all from freezing. It should still give us solid 6-7 months of not using the septic. 1) pipe size - in the Oasis book, the recommended pipe size is ~ 1.5'', to ensure that solids (food bits and such) aren't deposited on the pipe. Our stub-out is 3'', if I'm not mistaken - the regular size for sewage plumbing. How do we reduce the pipe without creating a clog spot? 3) toilet paper. Our current system is poo in the humanure toilet, pee in the regular toilet (otherwise we have an odour issue; Hodor?). We "let it mellow" to not waste flushing water. But that means a fair bit of toilet paper accumulating between flushes. I'm guessing a 1.5'' pipe isn't meant to deal with that. What would you recommend? Use a litter bucket to collect used TP after peeing (my partner will likely object)? Use cloth (again, likely object)? Flush more? Thanks for all the awesome info! Karen - we meet again - I've never heard of this method, but it sure sounds awesome, especially that I don't have much room for the early stages of plants, but have lots of room for them outside. I'll look into it, and come up with some combination of dense planting, grow lights, and a cold frame.